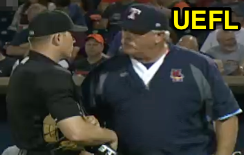 In his native Triple-A, MLB call-up umpire Toby Basner ejected Toledo Mud Hens Manager Mike Rojas over a balls/strikes dispute late in the Bulls-Mud Hens game. With two out and none on in the top of the 9th inning, Bulls batter Casey Gillaspie took a 3-1 pitch outside from Mud Hens pitcher Logan Kensing for a called fourth ball. Basner ejected Rojas following the ensuing mound visit, after which Rojas protested by kicking dirt onto home plate. At the time of the ejection, the Bulls were leading, 5-3. The Bulls ultimately won the contest, 5-3. Wrap: Durham Bulls vs. Toledo Mud Hens (Triple-A), 6/16/17 | Video via "Read More"